Dr. Alex Ekwueme, a former Vice President, was transferred to a hospital in London after President Buhari gave an approval for his immediate transfer abroad for treatment. 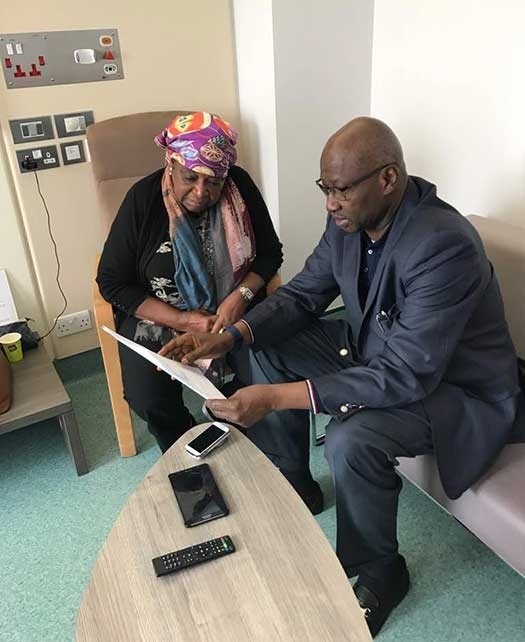 The Secretary to the Government of the Federation (SGF), Boss Mustapha, has visited a former Vice President, Dr Alex Ekwueme, in a London hospital. He conveyed President Muhammadu Buhari's goodwill message to Dr Alex Ekwueme. A spokesman for the President, Mr Garba Shehu, made this known in a statement in Abuja on Monday. Shehu stated that the SGF, who was in London before Dr Ekwueme's arrival, was received by his spouse, Mrs Helen Ekwueme, on behalf of the Ekwueme family. Mustapha told the Ekwueme family that the President and Nigerians were praying for speedy recovery of the elder statesman, adding that he believed that the doctors were doing their best. President Buhari had on November 3 approved immediate medical treatment of the former vice president outside Nigeria. The President's approval, according to a statement by Garba Shehu, followed a brief he received over the medical condition of the former vice president. Upon approval by the President, Ekwueme was rushed to the hospital in an air ambulance in what was described as critical condition. Ekwueme was reported to have collapsed in his house before he was transported to London for further medical attention.